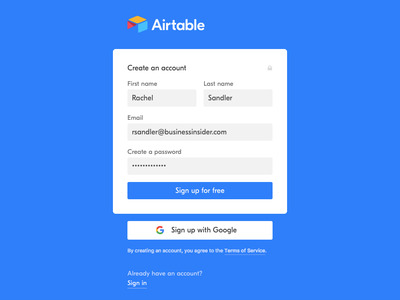 Everyone in Silicon Valley seems to be talking about Airtable, a user-friendly spreadsheet app that makes it super easy to build custom applications – no coding experience required. Airtable has achieved something of a cult following, especially among developers. Tesla uses Airtable to track inventory of vehicles as they leave the factory; $US20 billion office-space startup WeWork is a customer, too. 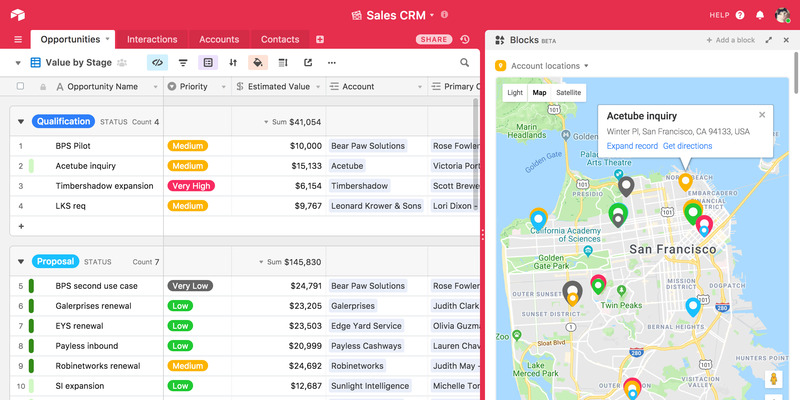 With a recently announced $US52 million in new funding, Airtable has ambitious plans to become the next Microsoft of business apps. 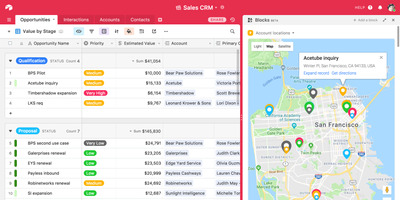 Airtable can store information in a spreadsheet that’s visually appealing and easy-to-use, but it’s also powerful enough to act as a database that businesses can use for customer-relationship management (CRM), task management, project planning, and tracking inventory. 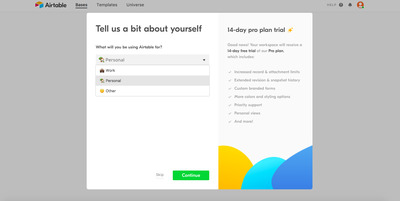 Airtable is entirely on the cloud – so you don’t hve to download anything to use it. Enter your email and a create a password to sign up. Airtable refers to each project as a base, as in database. I’m using the free Airtable service, which gives me unlimited bases, 1,200 records (or items you can keep track of) per base, 2 gigabytes of space per record, and revision history going back two weeks. In my case, that means I can store records of 1,200 books. The least expensive paid option is $US10/per month. There are also Pro and Enterprise tiers that offer more records and space. There’s hundreds of templates to pick from, designed for all kinds of specific needs. 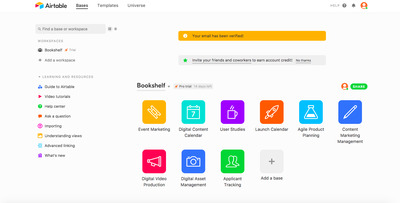 Airtable created hundreds of templates for nonprofits, startups, venture capital firms, engineers, publishers, and more. But there are also more personal templates, like ones for keeping track of which restaurants you visit, or places you’ve seen during an apartment search. After you create your account, you’ll see a dashboard where you have the option of choosing a template, importing a spreadsheet, or starting from scratch. Fill in the spreadsheet with all of the data you’re trying to organise. I chose a template to organise a new bookshelf in our office. 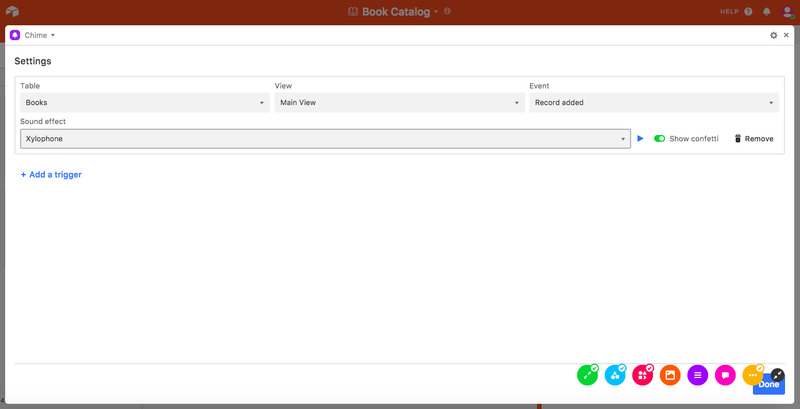 I input data for four books, and created a field that indicates if the book is “checked out.” Anyone in the office can access and update the table if they have checked out a book. 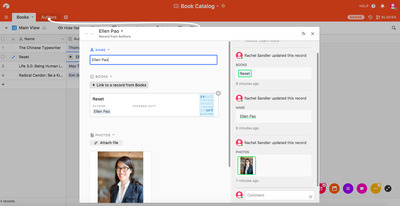 – You can add photos to cells, put in check boxes, and add star ratings. – Adding or changing a record works like a spreadsheet in Excel or Google Sheets – all you have to do is click into it and do what you need to do. – Using Airtable’s API, I can also view all of my data programmatically, which is valuable for developers. 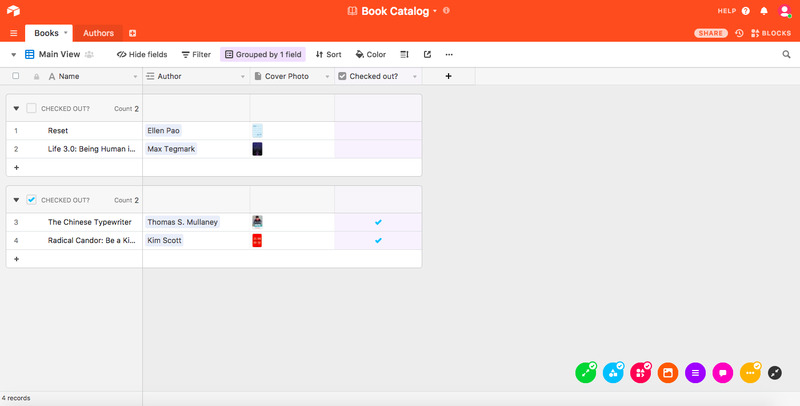 Back to the example of using Airtable to organise a bookshelf, I’ve made an “authors table” that has all of the authors of the books I’m trying to organise, plus an additional field for photos. Linking and creating relationships between tables is my favourite feature. 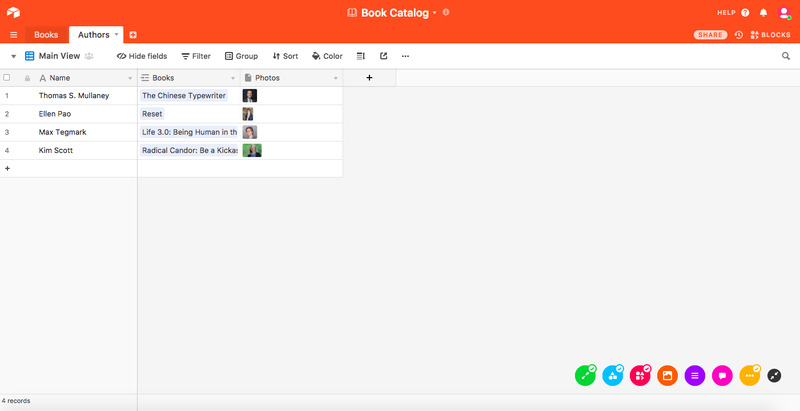 You can see tabs above the spreadsheet that list templates for the a books table and an authors table. 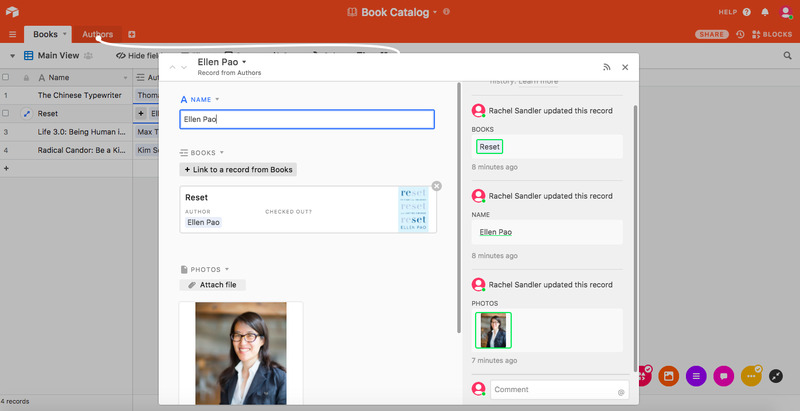 If I add a book with its author to the books table, the author of that book automatically shows up in the authors table. It’s a very clever integration. 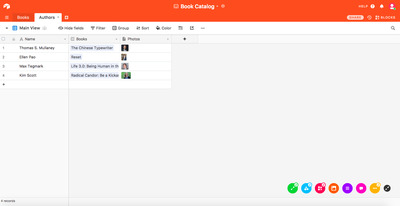 In the example of using Airtable to organise a bookshelf, clicking an author in the books table gives you a pop-up window with information from the author’s table. It’s a nice touch that keeps separate tables linked but organised, and also prevents you from needing to constantly go back and forth between tables. You can also organise your tables by various fields. 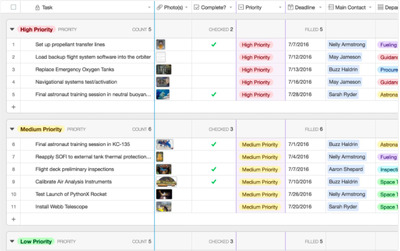 Airtable gives you the option of organising by field. 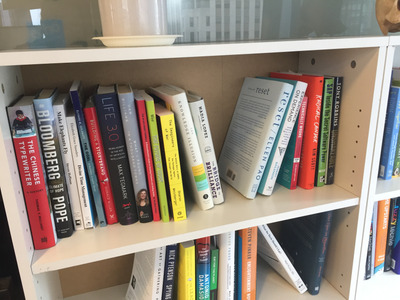 In the example of using Airtable to organise my bookshelf, I organised the books table by whether or not the book’s been checked out. If I had multiple books by the same author, I could also organise by author. Blocks uses the data in the tables you’ve already made, so you can have a block that lets you send texts to people (if you’re using Airtable as a contacts sheet), or a block that creates a countdown clock. My takeaway: Airtable is better than a regular spreadsheet, but it’s not worth $US10/per month for personal use. 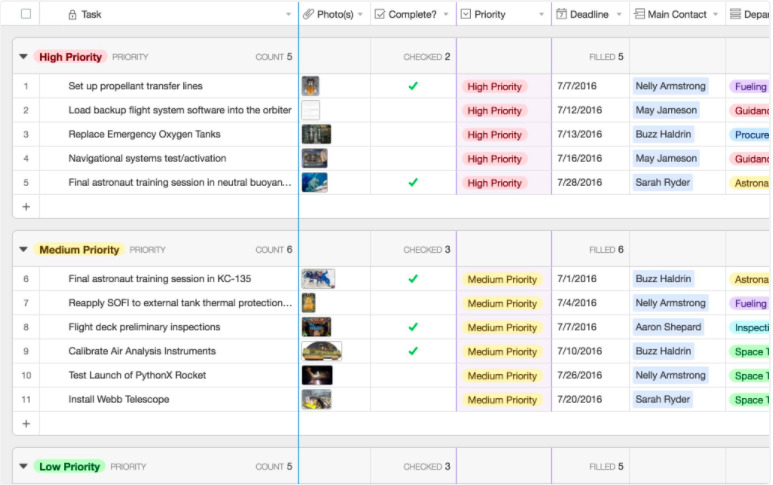 Airtable is super-easy to use, it’s visually appealing, and there’s some added features – like linking records and Blocks – that make Airtable better than a typical spreadsheet you’d find in Excel or Google Sheets. If you’re keeping track of more than 1,200 items, you’re going to have to pay at least $US10/per month. So while businesses are a different story, for personal use, it’s hard for me to justify paying $US10 for a spreadsheet. But right now, I don’t need more than that – so the free version works just fine. And in the end, Airtable’s organising efforts gave me a nice-looking bookshelf. 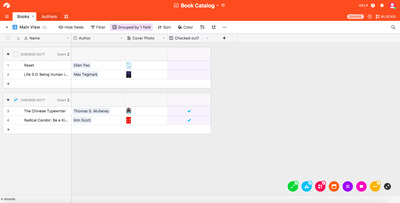 Thanks to Airtable, I can now keep track of what books are on the shelf and which ones have been taken out. 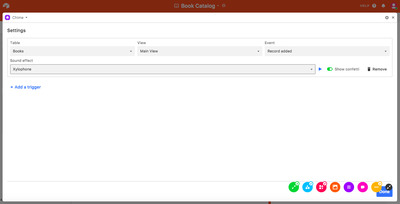 Anyone in the office can read and edit the spreadsheet, indicating whether they have borrowed a book. It may not seem like much, but this kind of organisation just scratches the surface of what Airtable can do.